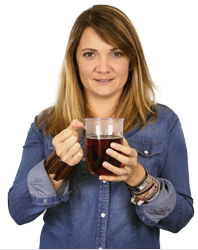 Celine, our tea expert, has selected a wide range of tea pods and tea capsules, so you can optimise the time you need to prepare your tea with the same delicious results. Browse our wide range of tea capsules, compatible with Nespresso, Tassimo, Dolce Gusto, Bialetti Mokespresso, Delta Q and Senseo machines. Pack of Dolce Gusto® compatible Earl Grey Green Tea capsules 5 x 10. Try these Fruits of the Forest capsules compatible with all Nespresso machines for a very flavourful, fruits of the forest infusion. Try these 10 Earl Grey Green Tea capsules compatible with all Nespresso machines for a refreshing and detoxing cup of tea. These Lemon and Lime black tea soft pods by Café Liegeois are especially designed to be used with a coffee pod machine, such as Senseo coffee machines. 1 pack of 20 soft pods. This infusion in pods offers a tasty blend of aniseed, liquorice, sweet orange, mint, hibiscus flowers and fennel. Compatible with machines made for ESE pods.